The hot water system might seem like an unlikely culprit for large energy bills, but did you know that the cost of heating water can make up 30% of an average Australian household’s total electricity bill? Your hot water system could be costing you big time, so we’ve compared electric, gas, solar and heat pump hot water systems to help you find the best and most cost-effective water heating solution for your home. Hot water systems come in two designs – ‘storage’ and ‘instantaneous’ (also known as continuous). A storage hot water system heats and maintains warm water in a tank until it is ready to use. This provides instant hot water, but is limited by storage capacity. Continuous hot water systems, on the other hand, rapidly heat up an unlimited amount of water when you need it. While it does take a few moments to heat up, an instantaneous system won’t waste energy by keeping water warm when no one is using it. Electric storage hot water systems heat water using an electric-powered element which sits below the water tank. Continuous systems work in a similar way, but instead the element is coiled around the pipes to rapidly heat the water inside. Electric hot water systems have quite low up-front costs and are a reliable way to keep your water warm. Some electric hot water systems can also be programed to do the majority of its heating during off-peak periods to help minimise your energy bill. Electrical hot water systems are almost always the most expensive long-term hot water solution. They also have high greenhouse gas emissions and are generally discouraged. Storage systems use a gas burner to continuously heat and maintain water in a tank. Continuous flow systems also use a burner which ignites only when the water is needed. Gas hot water systems produce less greenhouse gas emissions than electric systems. Additionally, depending on your location, gas systems are usually considered to have lower usage rates compared to electricity, making them the most cost-effective option long term. Gas hot water systems are only really viable if you’re connected to mains gas, as using LPG bottles is more expensive and creates the risk of running out of hot water. Gas hot water systems must also be located outside, or have an exhaust vent if they are located inside. Solar hot water systems are storage units which generate heat from the sun using panels installed on the roof of the property. This heat is used to warm and maintain the water in your tank. Solar hot water systems are able to reduce your hot water systems energy usage by up to 90%. Being that hot water systems are notoriously energy hungry, this could mean significant savings on your power bills. Solar hot water systems are also the most environmentally friendly option. Solar hot water systems have the highest up-front costs – anywhere from $2,000 to $7,000 after rebates depending on the system size, and excluding installation costs. Some solar hot water systems may also be unreliable on overcast days, though most models will kick-over to gas or electric back-up heating if the water isn’t hot enough. Heat pumps have a fan that draws warm air into the system, which is transferred to the water storage tank. It’s essentially a reverse fridge. Rather than pumping out hot air to keep your fridge cool, it pumps hot air in to heat the system up. Heat pumps are one of the most energy efficient hot water solutions. While they need electricity to run, they are roughly three times more efficient than traditional electric water heaters. Heat pumps are only suitable in warm environments. While some heat pumps do come with boosters, if the climate isn’t suitable, there is little benefit in spending the extra money on a heap pump. What’s the best hot water system? If you’re connected to mains gas and your home receives at least moderate amounts of sunlight, the most ideal system for you could be a solar storage hot water system with gas boosters. If your home doesn’t get much sunlight, the next best thing is an instantaneous gas system. However, there is never a ‘one size fits all’ solution when it comes to cutting your energy bill. It could be said that you should avoid electric hot water systems if possible, particularly instantaneous models, as they have high emissions and are often considered to be the most expensive option. 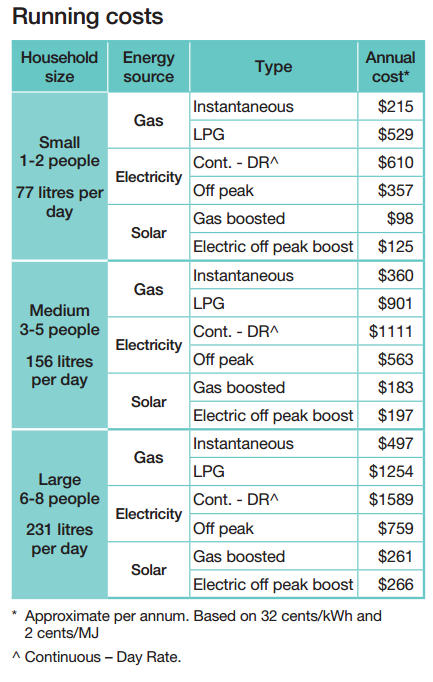 The below table courtesy of the New South Wales Government’s Smarter Choice Initiative shows the estimated running costs of different hot water systems. As mentioned, gas boosted solar storage hot water systems are the cheapest with an annual cost of only $183 for a medium sized household. LPG gas and continuous electric systems are the most expensive, costing $901 and $1,111 respectively per annum. Hot water is a necessity, meaning it’s somewhat of an inevitable cost. That said, there are ways to minimise your hot water systems impact on the energy bill. One of the easiest ways households with electric storage systems can save on hot water is with a controlled load. Sometimes referred to as a dedicated circuit or two-rate tariff, it’s an arrangement where the hot water system is metered separately to the rest of the house and charged a lower usage rate on electricity. Electricity is only supplied to the hot water system during off-peak hours, usually from 11pm to 7am depending on the electricity network. During these hours, the hot water system will heat the water and store it for use later on. Most hot water systems are installed with a dedicated meter, meaning retailers will often put you on a controlled load tariff by default. 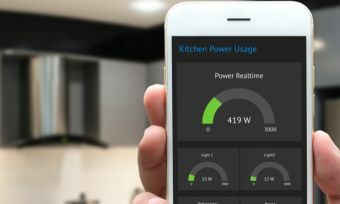 If for whatever reason you don’t yet have a controlled load tariff, Canstar Blue calculates that you could stand to save big by making the switch.